Subscribe to The Financial Brand via email for FREE!How consumers research and purchase banking products is complex. 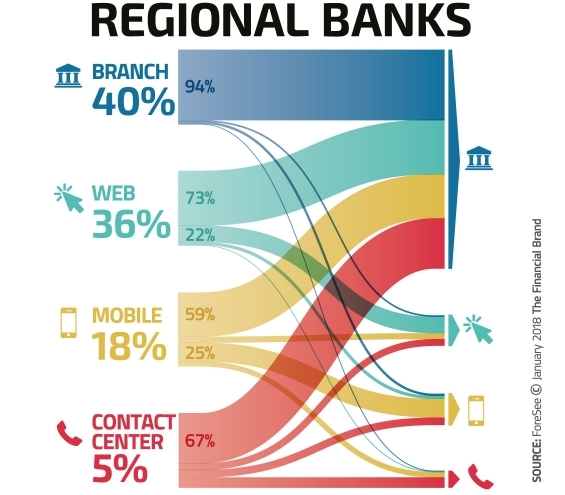 More than half start their journey either online or using a mobile device, and most of them end up finishing the process in a branch. 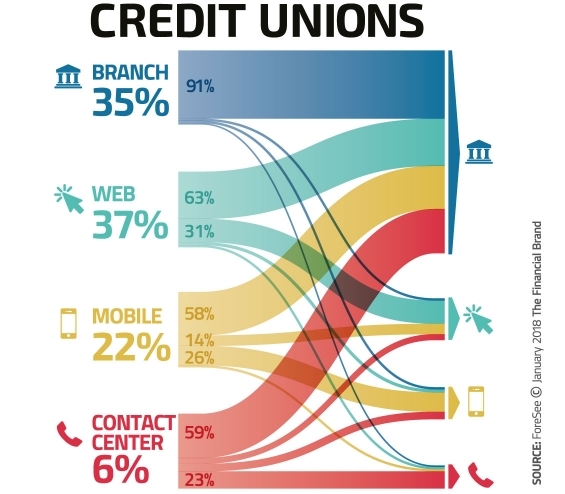 As part of their analysis, ForeSee broke down the customer journey, comparing the starting point and end point between national banks, regional banks and credit unions. 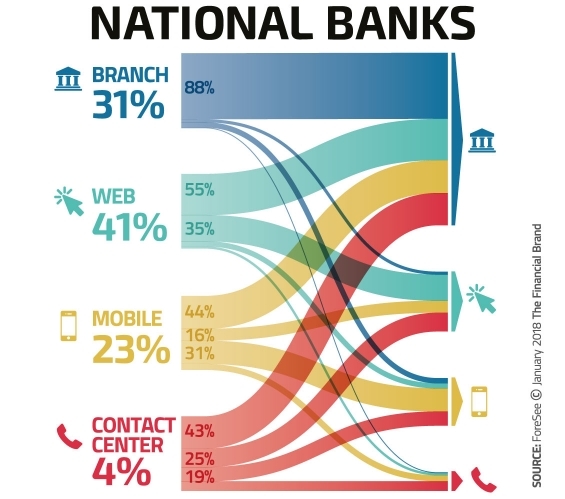 Their resulting illustrations are among some the best infographics The Financial Brandhas ever seen — telling a rich, complex story in a simple, visual format. The amount of data available to marketers using digital channels is immense. But while digital is lauded for its ability to allow brands to reach the right consumer, at the right time, in the right environment, the question remains whether it is an effective medium for mass marketing. Digital channels are often accused of making marketers think too narrowly in their activity, meaning they sacrifice reach and long-term growth for narrow, short-term metrics. Brands have become more acutely aware of this trade-off since the publication of Byron Sharp’s book ‘How Brands Grow’, which suggests marketers should replace targeting with “sophisticated mass marketing”. Last year, Procter & Gamble’s chief brand officer Marc Pritchard confirmed the company was moving away from targeted Facebook advertising after calling its approach too “targeted and narrow”. P&G, however, insisted it was not planning to cut its total investment in Facebook and would continue to use targeted ads for some products, such as selling nappies to expectant parents. Both statements would indicate that the brands are following Sharp’s recommendation to “continuously reach all buyers of the category” and move away from standard segmentation and targeting if they want to grow their business. It is often not digital that springs to mind when looking to reach people at scale. Aviva’s brand communication and marketing director Pete Markey says there is a “sweet spot” of people the insurer wants to reach, but argues that if a business becomes too narrow, it will not be visible to customers. Instead, he suggests the best segmentation is one the entire business can use that goes beyond targeting to focus on the experience the brand wants to give the audience. IPA director of marketing strategy Janet Hull believes the natural progression is towards personalisation, driven by the rise in data generated by digital and social media. “The insight you get from data you can then expand on, starting with the individual. That approach gives you more nuance, so you can serve creative work that works and improve the quality of advertising online and offline,” she adds. Brands can use targeted marketing communications to deliver personalisation, which drives increased engagement and conversion rates, according to the IPA’s Social Works Personalisation guide published in March. However, the report acknowledges that strategies designed to increase brand relevance should always be balanced with campaigns that drive reach through mass marketing. When The Economist wanted to increase brand awareness and drive subscriptions, it targeted a group of people labelled the “globally curious”, modelled on its database of existing subscribers. Despite being targeted, this was by no means a niche group, with The Economist estimating the number of globally curious people was close to 73 million. “If a brand is to solve an awareness challenge, then reach is important, but we don’t conduct reach campaigns just for the sake of it. There will always be a longer-term goal and everything we do has a KPI to it,” explains Mark Beard, senior vice-president of digital media and content strategy at The Economist. This was the approach taken by The Economist for its digital marketing campaign ‘Raising Eyebrows and Subscriptions’. The aim was to provoke the audience by serving them content they couldn’t ignore in order to demonstrate the relevance of The Economist’s journalism. The idea was to give people “their own epiphany” by offering content that compelled them to subscribe. Part of this strategy involved placing ad units on articles the globally curious target group were already reading, which showed them a hopefully more interesting article authored by The Economist team. The success of the campaign was highly measurable, generating 5.2 million clicks and 64,000 new subscribers worth £51.7m in lifetime revenue. The campaign, which won a Gold Cannes Lion last year, continues to run and has evolved to include an element of video. The discussion is moving beyond reach to ‘attentive reach’, which takes into consideration more than just viewability. Mondelez International’s digital and social media manager Pollyanna Ward is an advocate of operating an always-on digital strategy, which feeds into a wider campaign across TV, experiential and outdoor. “For us in FMCG, we need to reach everyone. There’s no one specific audience. For us, the priority is always going to be reach. So you might have an always-on strategy where you’re planning things for an entire year and you might continuously pump out a brand message on Facebook, Twitter or YouTube. Concerns continue to persist over how effectiveness should be measured in the digital age. Facebook fuelled the fire last year after revealing a number of errors in the way it measures audiences, admitting it overstated for how long users watch videos on its site by up to 80%. This, in part, led P&G’s Pritchard to launch a searing assessment of the industry’s “murky” supply chain in January, blaming the “antiquated media buying and selling system” for its inability to cope with the technological revolution. Last month, meanwhile, WPP CEO Sir Martin Sorrell urged Facebook and Google to step up and “take responsibility” for measurement errors and ad fraud, arguing the major digital players are “clearly not doing enough”. ” data-evernote-id=”177″>[≈ Construction cost for Gerald R. Ford-class aircraft carrier] (£6.9bn). So as brands appear unlikely to move ad spend away from the platform, it is more important than ever to find new effectiveness metrics. Dixons Carphone’s commercial marketing director Jonathan Earle suggests one method is to add bespoke codes to track customers who purchase as a result of seeing an advert on Facebook or YouTube. However, if marketers want to drive sales, he argues there are digital channels that deliver much stronger results than social media. “If the metric is to get as many people thinking about us as possible, then social has a clear role to play, but if you want to drive sales, that’s where pay-per-click comes in,” he explains. Earle argues that pay-per-click (PPC) is the most measurable marketing channel, serving content to customers that matches their organic online search terms. The team can then track that traffic from the click-throughs all the way to conversion and order value. The PPC activity takes between seven to 10 days to maximise, says Earle, who advises marketers to be clear upfront about what it is they want to deliver. At Google and YouTube, the response to measurement issues is to offer free tools like AdWords and brand lift surveys, as well as third-party viewability verification. “The discussion is moving beyond reach to ‘attentive reach’, which takes into consideration more than just viewability,” explains Google brand planning industry lead Gerald Breatnach. “We tend to think of this in terms of ‘WAVE’ – measuring watch time, audibility, viewability and engagement. Marketers not only need to know how many views a campaign has generated, but the unique reach of the campaign and the average watch time. Ultimately, these campaign metrics need to link to sales results,” he says. Understanding that success looks different on each channel is crucial to accurately measuring effectiveness and in the digital landscape there is no one-size-fits-all approach. “If I wanted to make an impact with the younger generation, I would be looking to see how effective Snapchat is at delivering impressions, but when it comes to different channels I would be looking at the view-through rate to see if we have made an impact,” Ward explains. Reach is important, but on its own it isn’t good enough. Google’s Breatnach agrees it is a mistake to think all digital channels work in the same way or only equate to “tightly targeted” performance marketing.“Online video advertising on YouTube, for example, has the potential to offer attentive reach and deliver long-term brand results,” he explains. Peugeot’s marketing director Mark Pickles appreciates that to measure digital effectiveness you need absolute clarity about what you want to achieve. “For a new product, the primary focus is likely to be on reaching mass awareness within the identified customer segments. Whereas with an established product, often the place for digital is to convert existing awareness into some form of action – what I call a ‘nudge’ – which pushes the consumer a little closer to us,” he says. The Peugeot marketing team generally sets several secondary objectives and a primary objective, which Pickles emphasises it is important to be realistic about. Hull argues that it is fundamental for marketers to understand the difference between what they are doing for the long term and their brand activation objectives. “You also need to make sure you’re getting the right investment for the KPIs that you’re setting, because there’s no point setting KPIs and then not putting the right amount of money behind them,” she explains. Armed with the ability to optimise 24 hours a day, seven days a week marketers now have the opportunity to tweak campaigns in real time. Aviva uses econometrics and attribution to measure effectiveness, combined with its brand impact index, which investigates brand health. Markey argues that marketers cannot afford to ignore the opportunity to optimise. “The idea that as a marketer you can be asleep at the wheel is so wrong. To push a campaign out and hope it works or do campaign evaluation at the end would be insane, lazy, suicidal,” he says. However, when exploring real-time optimisation marketers must resist the temptation to make knee-jerk decisions, which take them away from their original KPIs. “When you’re spending money on a campaign that’s aimed at trading and selling, and you say ‘I want to sell 20 of this thing and I only sold three’, you can pull that money and put it somewhere else,” says Markey. It is not what you track, but what you choose not to track that’s important. The Economist’s Mark Beard agrees that it is very easy for marketers to fall into the trap of tracking everything on a digital campaign just because they can. “It is not what you track, but what you choose not to track that’s important. We track two things predominantly – the number of prospects we’re bringing in and how many subscribers we’re generating as a result of those prospects,” he says. This is where human input plays a vital role, says Beard, ensuring the right KPI is chosen at the outset and setting up the artificial intelligence to operate at its optimum. In a world where optimisation can happen at the touch of button, it is more crucial than ever for marketers to set out with a clear appreciation of their KPIs and then design their digital activity to deliver as part of a holistic strategy. The objective: Australian swimming pool company Narellan Pools teamed up with agency Affinity on a targeted, data-driven digital campaign to increase its share of the crowded Australian market. The research: The cross-referenced five years’ worth of first-party data, including sales, site analytics, leads and conversion rates, with five years’ of third-party data spanning the weather and consumer confidence. The research found sales spiked when there were two consecutive days with higher than average temperatures. The campaign: Looking at the weather across 49 regions in Australia, the team fed real-time temperature data into the programmatic platform. When the right conditions were met, it activated the campaign across search, pre-roll video, banner and social, targeting people who had already shown an interest in buying a swimming pool. The result: As Narellan Pools only advertised when the specific temperature conditions were met, the company was able to reduce its media spend by more than 30%. The campaign drove a 23% increase in sales and generated an incremental return of investment of $54 (£34) for every $1 (62p) spent. The campaign also went on to win the 2016 IPA Effectiveness Award special prize for best small budget campaign. Source: chiefmartec.comWith apologizes to Moore’s Law. Curated for you by marketingIO: One Source for All Marketing Technology Challenges. Perhaps you could blame the dozens of devices consumers now carry in their pockets. Or maybe paper is just too outdated for the delicate hands of a millennial. One thing Is forcertain: marketers are not getting as excited by newspapers as they used to. Last year, print ad spend fell 11% to £1.22bn for the UK’s national newspaper industry,according to the latest expenditure report by Ad Association/WARC. A sharp contrast to the 2.5% growth the nationals secured from digital ad revenues and internet ad spend’s 17.3% rise to £8.6bn. The UK’s most prolific print advertiser in 2015 was BSkyB, which invested £47.7m, according to Nielsen. However, this was a 15.9% fall compared with 2014 and a 22.4% slump from the £61.5m it pumped into print advertising in 2013. Sky is not the only major brand moving away from print. Since 2008, the country’s biggest supermarket Tesco has gone from highs of £61.6m (in 2010) to investing just £25.1m in printadvertising last year. And traditionally newspaper-heavy sectors such as cars and B2B – with the latter often relying on recruitment ads – also both appear to be abandoning ship. For the period 1 July 2015 to 30 June 2016, automotive brands dropped their ad spend in UK newspapers by 24.2% year-on-year to £104.8m, with only government and politics (-32.2%), office equipment and stationery (-35.7%) and business and industrial (-31%) recording steeper falls. In fact, at the halfway point of 2016, the UK’s top 10 print advertisers had invested just £127.2m in the channel. And while Brexit was good news for newspapers in terms of readership numbers, it has raised concerns over marketers’ spending habits. Subsequently, it would probably take a minor miracle for newspaper ad revenues to match the £457.9m highs seen back in 2010. Furness’s encouragement is partly because the decline in ad revenues for national newspapers is projected to almost halve (to a 5.9% decline) in 2016 and slow even further to only a 3.4% decline by 2017, according to Ad Association/WARC. “>[≈ population of Conakry, capital city of Guinea], meanwhile, still “actively consider” buying The Guardian on the weekend. Duncan could have a point, with recent figures from the Audit Bureau of Circulation, the independent body that verifies newspaper sales data, showing a much-needed surge. The Times posted a 15% rise in print sales in June – boosted by the EU referendum result – compared with the same period last year. The Guardian, meanwhile, increased its average daily sales by 3.6% in June compared with May, while the FT improved its average daily sales by 0.49% over the same period. At the other end of the market, The Sun was up 2.6% month-on-month, with The Daily Mirror the only daily national title to post a decline as its sales dropped 1.02% in June compared with May. “When there’s a big story, people are still turning to a newspaper for the definitive coverage,” explains Duncan. Rufus Olins, CEO at Newsworks, says marketers are suffering from what Marketing Week’s columnist Mark Ritson has described as “digital delirium”. Subsequently, he claims marketers are returning to print in big numbers. A recent study by Newsworks claimed that adding print newspapers to a multichannel marketing campaign can boost return on investment threefold. According to the study, which was conducted by Benchmarketing and looked into 500 econometric marketing models built over the past five years, newspapers make TV campaigns twice as effective and online display four times more effective. “>[≈ population of Spain, nation] reading them in one form or another. In particular, Olins singles out Lidl as one of the brands that has benefitted most from backing print over recent years and one that can create a “ripple effect”. Print can also, at times, provide more value and less distractions than digital. Gaunt explains: “Digital advertising has unique strengths and is an important part of our media mix but these strengths can come at a premium and it needs to be used judiciously. Digital needs to be interrogated just like any other medium and, for certain communications tasks, print still holds it’s own: for communicating a simple message to a broad, mass audience print can reach a lot of people with effective formats at comparatively low cost. One of the main ways newspapers are winning back advertisers is by experimenting with new ad formats. At The Guardian, Furness says its new ‘barndoor format’ – essentially a gatefold on the front page – has created a real buzz and has already been adopted by brands such as Heineken, which have been vocal about prioritising digital ad spend over traditional in recent years. Newspapers are also taking some queues from digital – taking on risk by launching new products that are allowed to fail fast. In the case of Trinity Mirror’s The New Day and CN Group’s “newspaper for the north” 24 the bets did not pay off and the new publications were closed down. Archant has just pledged to continue printing The New European, after the pop-up paper “exceeded” sales targets and Will Hattam, chief marketing officer at Archant, says the new model can “revolutionise” the newspaper business. In March, Waitrose raised a few eyebrows when it said print remained its “most effective” advertising channel. However, four months on and it isn’t changing its stance. Waitrose’ ad manager Joanna Massey explains: “We do generally see a good NPROI for print advertising, which is why we continue to advertise in this medium. Each campaign is different and the effectiveness of a channel very much depends on the type of campaign (brand building or direct response), the individual campaign objectives, level of spend, a number of other variables and also how one defines and measures effectiveness. But for brands such as Waitrose to continue backing print, Alex Steer, head of technology, effectiveness and data at media agency Maxus, believes newspapers must become better at selling themselves. Since January 2016, research firm Lumen has used laptop-mounted eye tracking camerason 300 consumers’ laptops to collect visual data on what they notice when they are online. And over this period the study, which was run in partnership with Nectar-owner Aimia, recorded 30,000 minutes of data, with evidence relating to around 15,000 digital ads. It found that only 44% of digital display ads received any views at all. And, of those, only 9% of ads received more than a second’s worth of attention. Only 4% of ads, meanwhile, received more than two seconds of engagement. In comparison, almost half (40%) of press ads were viewed for more than one second and aquarter of print were viewed for more than two seconds, nearly six times the rate of digital. But even if the Lumen study proves consumers are still interested in print ads, The Guardian’s Furness says print brands must not get carried away. Digital advertising remains the UK’s single biggest advertising channel and is set to grow beyond £10bn by 2020, according to the IAB, and Furness says print must facilitate this shift. While Sky has grown advertising spend in online media, it certainly doesn’t signal the death of traditional media like television, outdoor and print. In fact, advances in data and technology have significantly enhanced the opportunities available in traditional media, as well as giving us a better understanding of true effectiveness of online advertising. 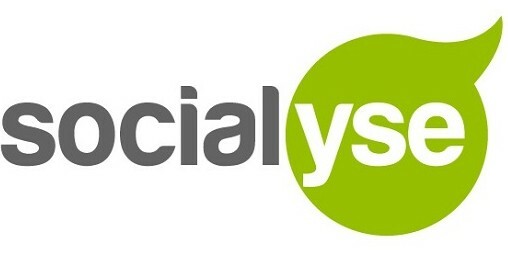 The data-led approach that has driven the success of Sky’s enhanced TV targeting on Sky AdSmart is being increasingly replicated by the news brands, particularly those with access to good customer data. We are having an increasing number of conversations with publishers who can bring together editorial expertise, creativity, access to talent and an opportunity to personalise communication with our different consumer segments. For the marketing team at Sky, there is no doubt that print remains a valuable advertising channel. To kick-off our recent campaign for Sky Cinema, we partnered with The Sun’s new film magazine launch Popcorn. We created an integrated editorial section called ‘Microwave Popcorn’ with features on upcoming movies, front cover branding, ads in the magazine and a takeover of The Sun Online’s dedicated film channel, all working together to communicate the benefits of Sky Cinema as the market-leading movie subscription service. The contextual environment that print offers means that tactical advertising can deliver huge impact. To celebrate Team Sky winning the Tour de France for the fourth time, adverts this week appeared in relevant content in both print and iPad editions across a number of news brands. Magazines played a core part in the recent launch of Sky Q, allowing us to reach tech opinion formers with a range of messages to demonstrate the superiority of the new Sky Q service. Print advertising remains a key channel to drive both long-term brand metrics and short-term sales effectiveness, consistently delivering a positive return on the significant investment Sky makes. Contact the coordinator: Thierry Antoine ( tantoine@ulb.ac.be or 02/650.41.45). Register at the information session on June 7, 2016 from 18:30, in the premises of Solvay Brussels School (42 avenue Franklin Roosevelt, 1050 Brussels (Atrium on the ground floor). This completely free evening, which includes a walking diner, will let you ask the organisers all your questions.